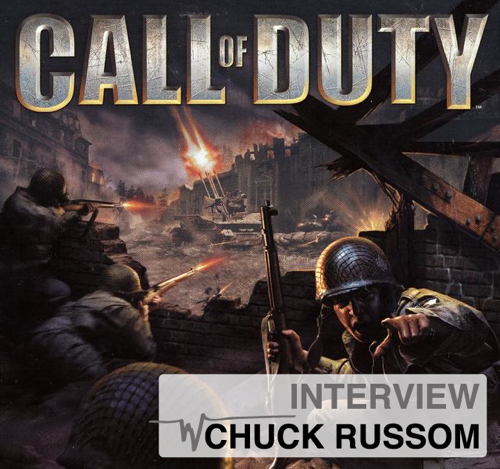 Call of Duty (released 7 years ago) was one of the most important jobs for Chuck Russom, so we decided to make an interview talking about that game and what it meant for his career. Designing Sound: How do you get hired on Infinity Ward and how do you get involved with Call of Duty? Chuck Russom: It’s crazy when I think about it, the first Call of Duty game was 7 years ago. So many of the opportunities I’ve had in my career came about because of my work on that game. It’s also been insane to watch the Call of Duty franchise grow into one of the most successful game franchises ever. My relationship with Infinity Ward started with a job posting on a website. I was looking for a new game audio gig and I found a post by a new company that wasn’t too far from my house. I contacted them and found out that the company was formed by a bunch of guys who had worked on Medal of Honor: Allied Assault. That game was very successful and had amazing audio work, so the chance to work on a project with Infinity Ward was very appealing. After an initial meeting, they decided to contract me for a month to work on their first playable level. After that was complete, they hired me on fulltime to work on the rest of the game. DS: I think your relationship with the rest of teams had to be even more “active”… How was that process of feedback and organizing all the stuff together? CR: Everyone at Infinity Ward was very aware of sound. It was quite the opposite of most teams. I never had to step up on my soapbox and complain about the importance of sound. I didn’t have to spend my time convincing designers to hook my sounds up. The designers would have sound in mind while they were building an event. They would usually have sound requests to me before I had even seen the events they were working on. DS: Being the only sound designer, and being your first project doing too much things, how do you organized your workflow? How long the project took to you? CR: I don’t know if there was really any organized aspect to it. It was chaos! I pretty much learned as I went, though trial and error. It was my first time working on a game in that genre, my first time leading the audio, my first time working on something so high profile. I worked on the game for 9 months, and it was full bore the entire time. It never really slowed down. There was a mountain of work, and I just kept digging at it until it was done. DS: How the limitations of that generation platform affected you on the sound specifically? CR: Actually, Call of Duty was the first game (and the last) that I didn’t feel limited by the tech. We only shipped on PC, so I really had more memory available then I knew what to do with! Way beyond any game then I had worked on before. It was the first time that I was able to keep my sound assets at 16 bit 44.1K, which was so huge to me. It was also the first time that I had any tools that I could use to control the way sound worked in game. DS: Did you get influenced by some other warfare game or film? CR: Saving Private Ryan really changed my life. When I first saw that film, I had already been working as a sound designer for a couple years. I was totally blown away at the audio work in that film, I knew that I wanted to do work at that level, that I absolutely had picked the right career for me. Going into Call of Duty, I was very influenced by Saving Private Ryan, as was the game team. 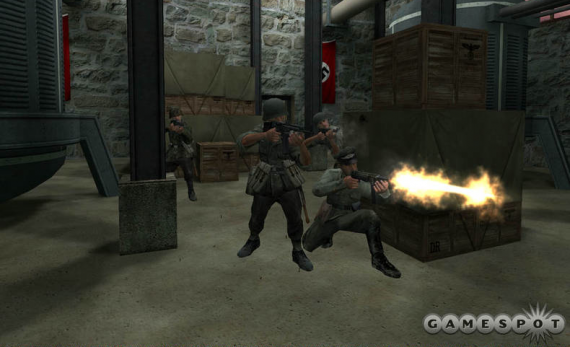 The team was also very influenced by Band of Brothers and Enemy At The Gates, so those also became an influence. I spent a great deal of time watching every war movie or movie with guns that I could find. 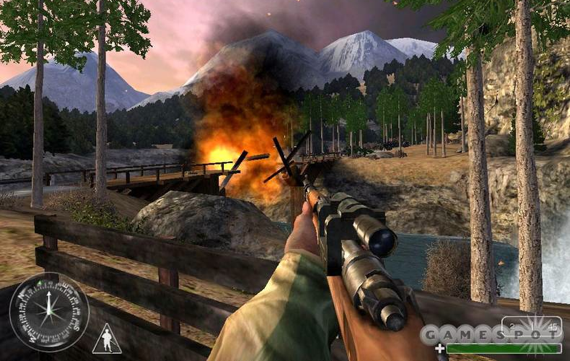 The Medal of Honor games were a big influence, since that was our main competitor. Since most of the team had worked on Allied Assault, the audio on that game was referenced quite a bit. I spent a lot of time listening to the sound assets from the game, dissecting them, using nearly every sound as a reference to what I needed to match or better with the work I was doing. DS: You was also the implementer, mixer and apart of making the sounds you had to make all of them work on the gameplay. How was the implementation process done? What tools did you use there? CR: I had a lot of implementation help from the designers. They hooked up most of the sounds in the game. They also wrote me a script that I could use to place ambient emitters (fires, waterfalls, etc). As far as tools, Call of Duty was made in 2003, and audio tools have come a long way since then. I was using excel and a CSV file to control all my sound volumes, variations, fall offs, etc. It was way more control that I’d had on any previous game. The tech we had worked quite well and I was very happy with the sound coverage in game and with the mix. CD: That was your first time with a shooter game. How do you helped to make a great shooter experience? Is there a style or technique you used to enhance the player’s emotion? CR: I had worked on one shooter before, but it was fantasy based and nowhere near as intense or immersive. 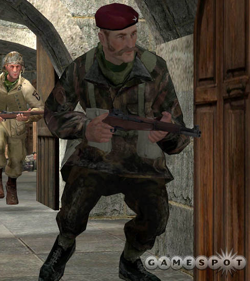 The approach on Call of Duty was to make the player feel like they were in the middle of the war. I had very dense and very loud ambient tracks playing at all times. The ambient tracks would have elements like gunfire at multiple distances, tanks, explosions, and even up close bullet impacts at times. This really gave you the feel that there was a lot of sound happening all the time. There more intense the level, the more dense I would make the ambient track. There were always a lot of AI characters on screen with you, both enemy and friendly. Just having all these characters near you shooting their guns, made for a real intensive experience. There were always bullets whizzing by or impacting near the player, mortars whistling and exploding near the player, guys shouting words that you couldn’t quite hear, it was all very LOUD! DS: Could you tell us something more about the recording process? I know it was your first time recording guns, so what stories you have on it? CR: We did 4 days of gun recording, capture both gunfire and bullet impacts. We had 4 different nationalities in the game, and each had 6-8 different weapons, so there were a lot of guns. We recorded most of the actual weapons from WWII. We teamed up with Spark Unlimited who were working on a different Call of Duty game (Finest Hour), so we did a combined gun shoot. I’d never recorded guns before, so I let Jack Grillo (Audio Director from Spark) handle the recording process. We recorded to 10-12 channels. I think we had a DA88 and a couple portable DAT machines. I do remember running a couple channels of mics on my Tascam DAP1. I can’t remember too many specifics, as it was 7 years and many gun shoots ago. DS: And what about the dialogue? Did your record that? How was the process? CR: I did some of the early dialogue recording. Handling the engineering, editing, and processing. As development ramped up, I was way too busy with sound effects to handle much of the dialog. The bulk of the recording and editing was outsourced. I handled the mastering and any processing that was needed. DS: That was your first time designing guns and warfare stuff. How was the creative process on the design side? What tools you used for that? CR: The tools I used then were not too different than what I use now. Protools HD, Sound Forge, and Waves Plugins. In addition to the guns that we recorded, I had every sound library that had guns. The process was a lot of trial and error. There were a lot of iterations. I made (and learned from) a log of mistakes. There were a lot of reworks up until the last minute. I had never designed gun sounds before that, so it took a lot of work to get to the sounds that we shipped with. One of the biggest challenges was the number and variety of guns in the game. There were probably 25-30 different guns in the game. Giving them all a unique voice was a huge challenge. It still is to this day, anytime I work on a project with a large variety of guns, its difficult. Guns just start to sound the same after a while. DS: What was the most you learn from working on this game_? And what was your favorite thing of working on Call of Duty? CR: The biggest thing that I took away from the project, something that’s had a lasting impact on me, is what to do when your best effort isn’t good enough. There were numerous times over the course of the project where I designed a sound, or completed a level/sequence, and while I did the work to the best of my ability, it just wasn’t at the level required by the team or the project. In a situation like this you have two options. The first option is that you can just give up. You convince yourself that you gave it your all, maybe you just are not good enough to compete at this level, you accept it and go away and cry about it. The second option, and the only one that is acceptable to me, is to face your challenge head on. Lock yourself in your room and continue to work and rework until you get to the level you need to be at, no matter how much time or how much effort it takes. It is really about complete tunnel vision, nothing can get in the way of achieving your goal. If you commit 100% of your focus and all of your time to a problem, and you tackle it from multiple angles, you will achieve the results that you are after. There is a song by Eminem called Lose Yourself that basically became my motivation song on that project. There is one lyric in the song that would constantly play in my head; “Success is your only motherfucking option, failure’s not.” I would constantly remind myself that, every time I thought I hit a wall while working on something. I’d listen to the song all the time in the car while driving to work, just to hammer the thought home. There as no way I could accept anything less than perfection. The game was just too good to have inferior audio. And the team expected nothing less than “award-winning audio”. Great work Chuck, good interview. It’s unfortunate that whoever is in charge of mixing the Call of Duty games at Infinity Ward is still stuck in the stone age. Even the latest Modern Warfare 2, the sound-field is extremely unbalanced, and… (wait for it) is only 4.1 channels. Sort of ruins the whole presentation. It might be an engine limitation but that kind of oversight is frustrating and perplexing. I have a question. Could you describe your work flow? Like as far as the what programs you use for what purpose. When do you use pro tools, and when do you find sound forge more useful? Also, if you use Max/MSP or Reaktor or any other programs. Thanks so much!